My blog post Using google test with CDT in eclipse gives details on how to install eclipse CDT, which is an assumed starting point for this post. 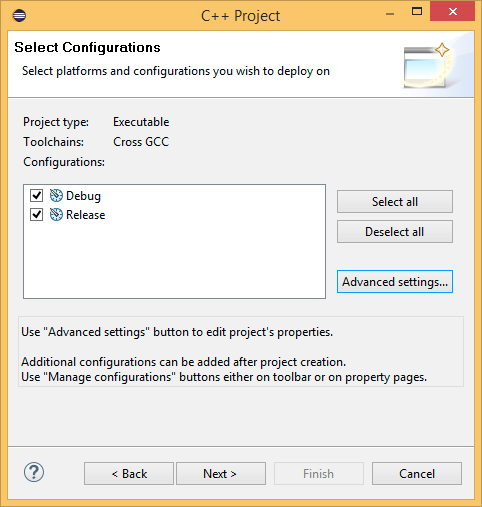 It is possible to build your own GCC cross compiler, however this is a complex process and prebuilt versions are available. 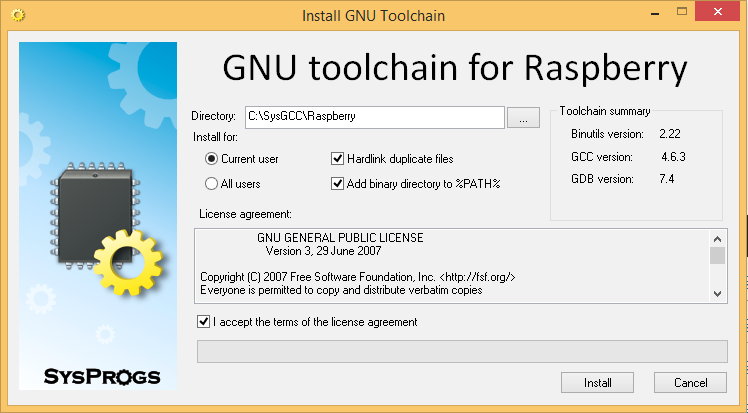 I choose to download from http://gnutoolchains.com/raspberry/, and selected raspberry-gcc4.6.3.exe to match wheezy raspbian. 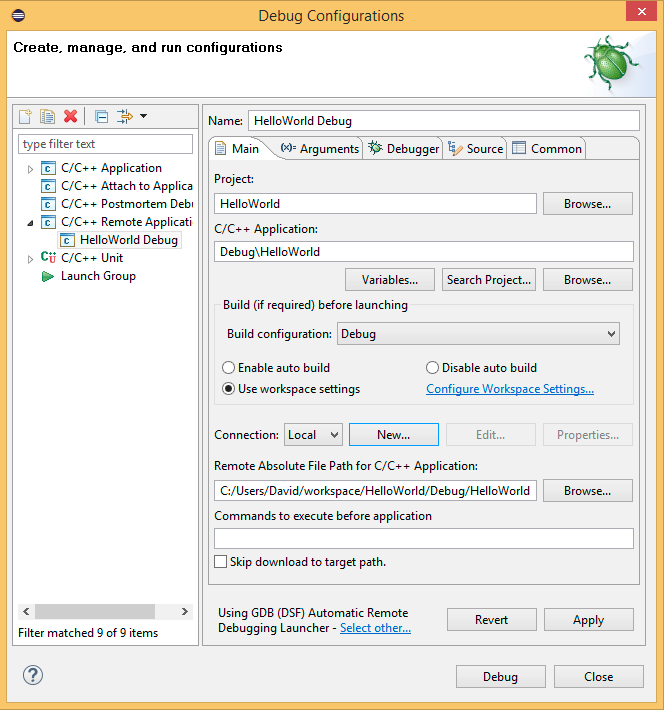 Installation was as simple as running the executable and accepting the terms of the license. 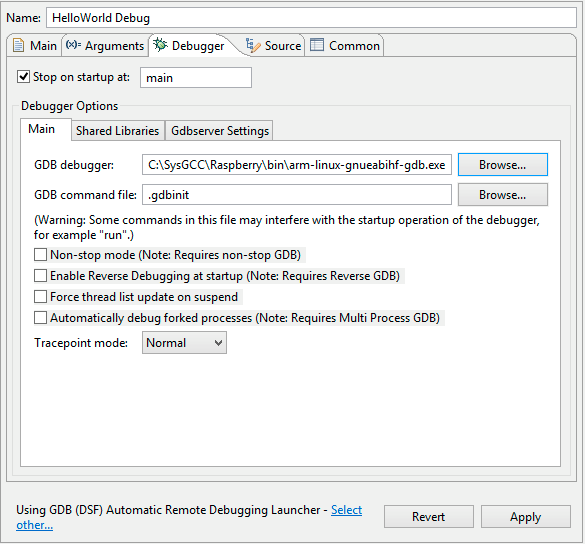 This step is required to ensure that the versions of headers and libraries used on the Raspberry Pi match those used by the cross compiler. 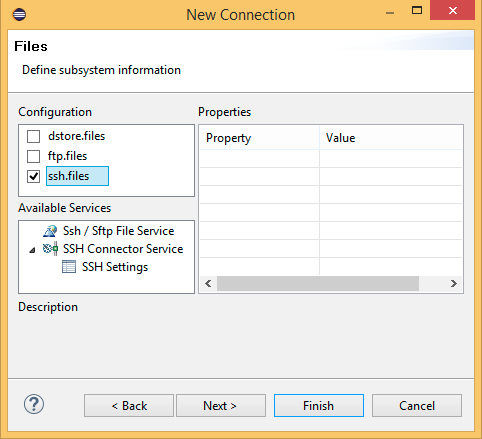 Press Select… and setup a new SSH connection to your Raspberry PI (Mine is running a newly installed image and has the default username and password). Click Connect and then save the key when prompted, then click Synchronize, wait while the headers and libraries are copied (This takes a few minutes). NOTE: Whenever you update your RPi it is a good idea to resynchronize to ensure that your development environment remains in step with your target. 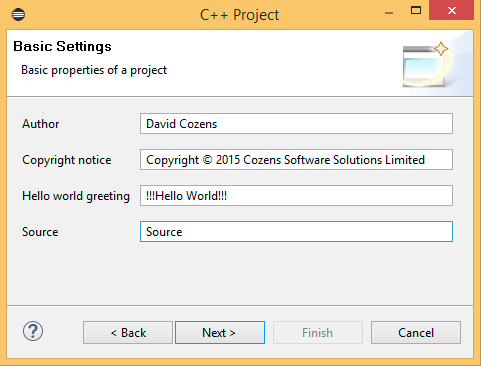 Open eclipse and in the Project Explorer right click and select New…->C++ Project. 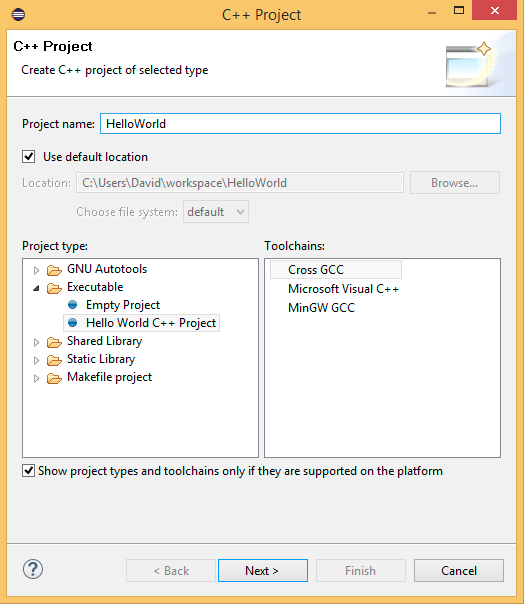 Select the Hello World C++ Project and Cross GCC, give the project a name. 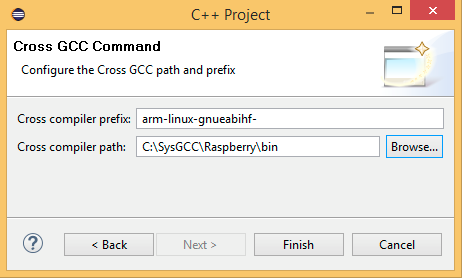 Click Next> and specify the cross-compiler prefix as arm-linux-gnueabihf- and cross-compiler path as C:SysGCCRaspberrybin. Click Finish and then build the project, there should be no errors. 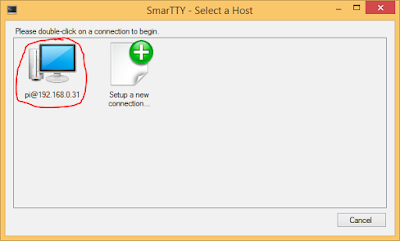 Run SmarTY.exe from C:SysGCCRaspberryTOOLSPortableSmartty, and open the connection to your RPi. 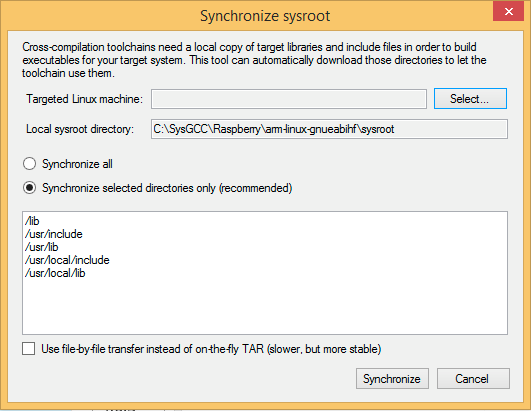 To automate the use of gdb on the target RPi it needs to have the DataStore server running. 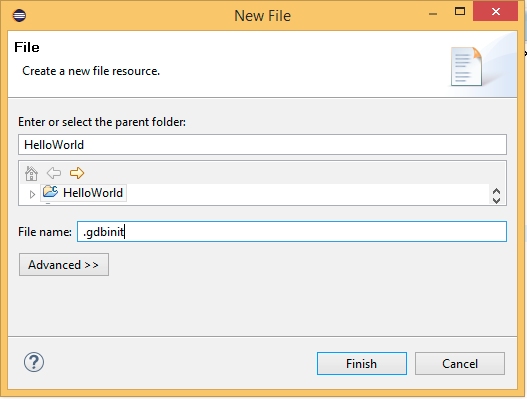 Right click on the HelloWorld project in the project explorer and New->File, set the name to .gdbinit and click Finish. 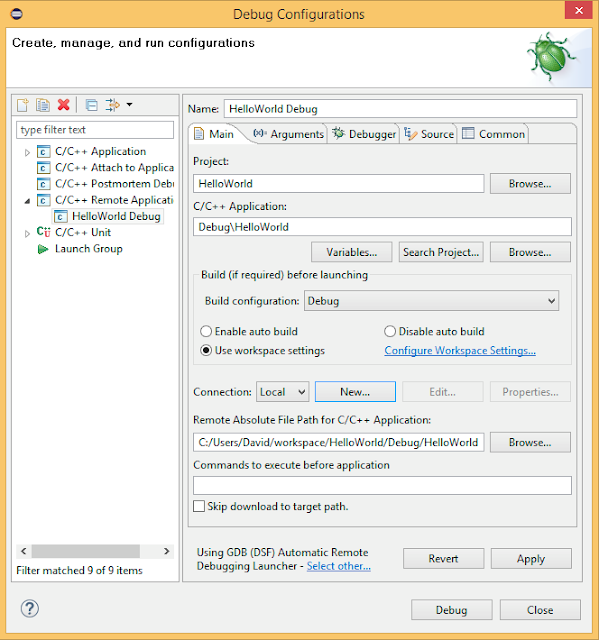 In the project explorer right click on the HelloWorld project and select Debug As->Debug Configurations…, then select C/C++ Remote Application and click the New button (circled). 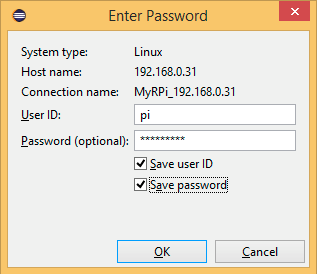 Enter the IP address of your RPi in Host name:, name the connection and set a description, then Next>. 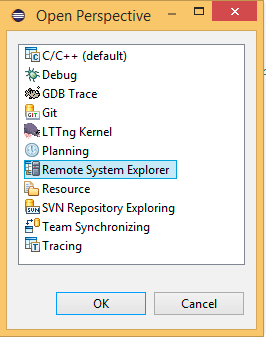 Select the remote-debugging directory and click OK.
Now in the Debug Configurations dialog select the Debugger tab and on the Main sub-tab browse to the arm-linux-gnueabihf-gdb.exe debugger. 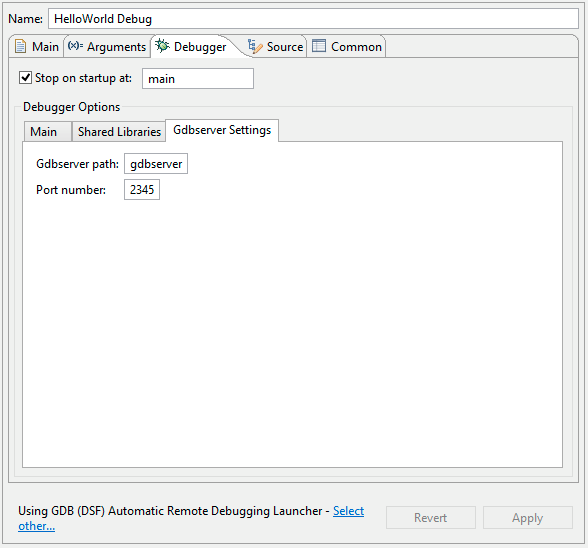 Now select the Gdbserver Settings sub-tab, the default settings worked for me and looked like this. Apply these settings, and Close. Click Window->Perspective->Open Perspective->Other... select Remote System Explorer, and click OK. 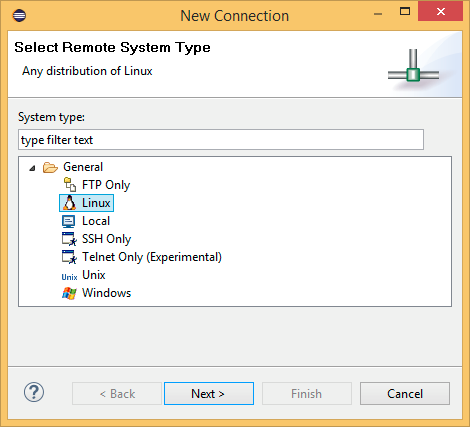 In the Remote Systems tab right click on your connection and select Connect. (I found if I didn’t connect to the RPi before launching the debugger the launch would fail, retrying usually worked – but this is cleaner). 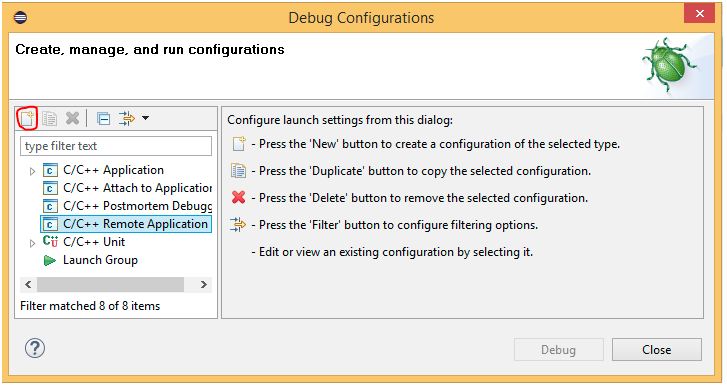 Now select Run->Debug Configurations, ensure your configuration is selected (it should be) and click Debug. You will be prompted to confirm the perspective switch, tick to Remember your decision and click Yes. I have tested this setup with setting breakpoints, viewing disassembly, stepping into and out of functions and inspecting variables. It all seems to work, however I have not yet diagnosed the error Cannot access memory at address 0x0. I will update this post if/when I get to the bottom of it. 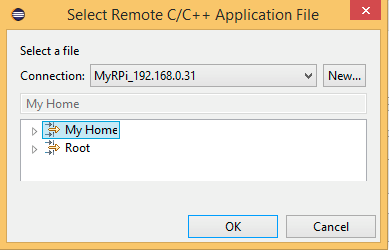 If you don’t have rm.exe on your path you will see an error like this when you clean the project. This can be resolved by downloading rm.exe as part of MinGW, find the path to rm.exe, (with a default install it is C:MinGWmsys1.0bin). Add this to the end of your windows PATH and restart eclipse. 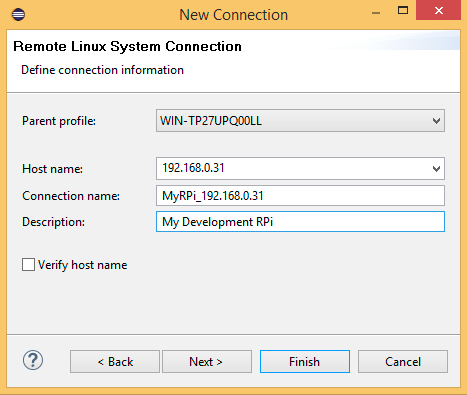 I develop for RPi by having a unit test project that compiles and runs on my PC for speed, and then a cross compiled project that shares the same source code and runs on the RPi. Posted in Raspberry Pi and tagged eclipse, GCC, RaspberryPi. 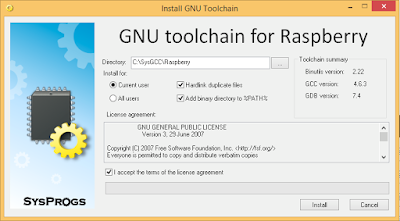 1) In my raspian jesse; the Shell.pm Perl library isnt installed by default, this library is required for auth.pl which is required by the DataStore server. That solved the authentication problem. 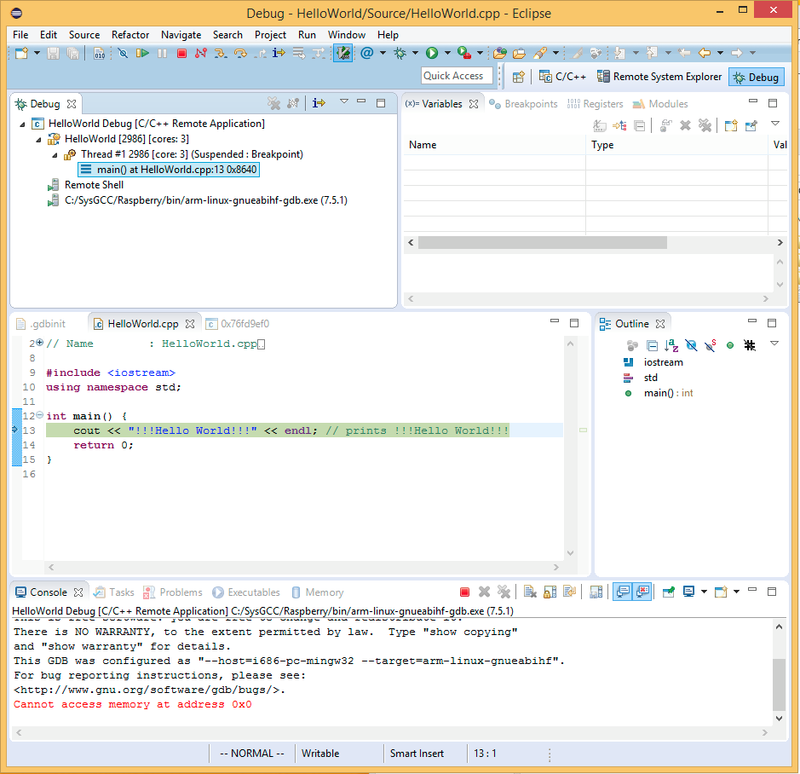 Properties->C/C++ General/Preprocessor Include Paths, Macros etc. and hit 'Restore Defaults' and accept. Once I did that it built without error. No idea what was going on there. Apart from these two caveats I followed David's instructions to the letter. 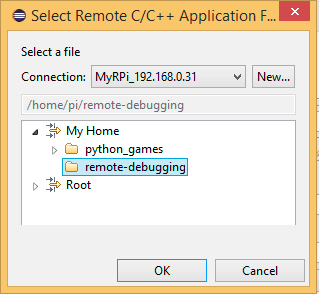 I am now able to cross compile and debug from Windows 10 to Raspian(Jesse) on the RPi. I'm pleased you are up and going. Neither are problems I've seen. Thanks for sharing your workarounds – they may help someone else. Could you exactly explain me how to install that Shell.pm library because I could not understand all your steps? I've tried what you'd written above but it didn't work at all.